South Africa is embracing the forefront when it comes to world-class golfing destinations with a diverse range of courses suitable for all abilities. Besides the mild climate, one of the great advantages of teeing off in South Africa is being able to combine golfing with a multitude of other fantastic activities, wildlife safaris and entertaining holiday experiences. South Africa is the perfect destination for keen golfers as well as non-playing partners who might find themselves thinking they love being a ‘golf-widow’ (or widower) in South Africa! Combine your golfing holiday with a wildlife safari, the ultimate way to optimise your vacation time. For this, South Africa is the number one place in the world! Golfing near Cape Town and along the Garden Route links perfectly with safaris at Addo Elephant National Park, Lalibela and Kwandwe Game Reserves, all big 5 and malaria-free parks in the Eastern Cape. The Kruger National Park and Sabi Sands Private Game Reserve offer fabulous big 5 safaris that make outstanding add-ons before or after golf tours in Mpumalanga. 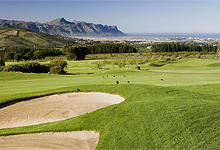 Below are five of African Travel Gateway’s best options for golfing destinations in South Africa. Or please contact us if you require assistance planning something a little different. Within the secure golf estate the lodge is situated on the first fairway, only a stone's throw away from the clubhouse. Erinvale Estate Hotel is only 45km/28mi from Cape Town. 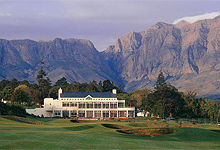 Negotiate the Gary Player-designed 18-hole course whilst admiring breathtaking views of the Hottentots-Holland mountain range and sparkling False Bay. Activities in the area include Cape Winelands tours, wildlife safaris, whale watching, hot air ballooning and nature walks. Mount Edgecombe Golf Lodge is an ideal base to explore KwaZulu-Natal’s northern Dolphin Coast. Golfers are spoiled for choice by two 18-hole championship courses set amidst tropical vegetation. Compliment your golfing holiday with a big 5 wildlife safari at Hluhluwe-Umfolozi Game Reserve, a trip to the Drakensberg Mountains or explore Durban’s beachfront promenade and uShaka Marine World. KwaZulu-Natal’s South Coast is home to Selborne Hotel and Spa. Selborne’s 18-hole course designed around pretty coastal forests provides a rewarding challenge for golfers of all abilities. Off the green, scuba diving, birding, beach horse riding and shark cage diving are available. 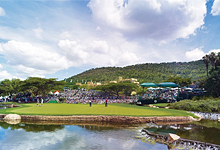 Golf fanatics will love Sun City in the North West. The parkland-style Gary Player Golf Course is rated in the ‘Top 100 Golf Courses in the World’ by Golf Digest, and the desert-style Lost City Golf Course offers challenging water features…including the 13th hole’s 38 Nile crocodiles! 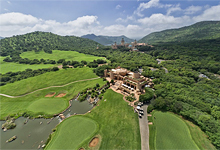 After finishing at the 19th hole, spend time enjoying Sun City’s casino, water park, adventure activities, shopping and wildlife safaris at adjacent Pilanesberg National Park. Mpumalanga’s White River Golf Lodge is right next to the first fairway of the estate’s 18-hole championship course. The Lodge is a perfect base to explore the breathtaking Panorama Route and Blyde River Canyon, and enjoy a big 5 wildlife safari at nearby Kruger National Park.